Cameroon will use police and soldiers to force children to go to school. 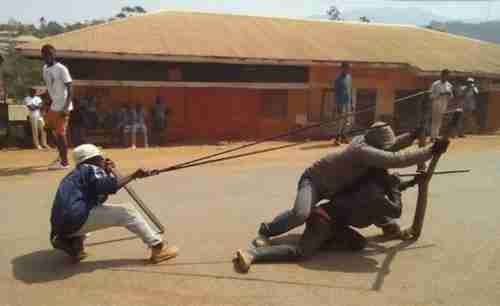 Tensions are growing in the Southern Cameroons provinces of Cameroon, the Anglophone (English-speaking) regions of the country. At least half a dozen schools have been burned down. The perpetrators are believed to be members of Ambazonia, the armed wing of the Liberation Movement of Southern Cameroons, a secessionist movement. Ambazonia is the name that the secessionists give to the Southern Cameroons region. The Anglophone minority is about 20% of the country's 23 million inhabitants. Starting late last year, there were protests by teachers and lawyers of discrimination by the majority Francophone (French-speaking) government. Anglophone lawyers protested that the legal and court systems are biased toward Francophones, with many laws passed without even being translated into English. Anglophone teachers went on strike last year, protesting that all courses in the schools had to be taught in French, and that any use of English was forbidden. Protests by Anglophone lawyers and teachers were dispersed by Cameroon security forces firing tear gas and live bullets. This year, Anglophone activists began using violence against the security police. The recent burning down of schools was presumably in support of the teachers' strike, which is still ongoing after almost a year. So-called "Ghost town" protests have brought Cameroon’s Anglophone regions to a standstill since the beginning of the year. The Cameroon government has tried a variety of nearly desperate measures to end the strike. In January, the government shut down all internet access in the Southern Cameroons, in order to end the protests. It never made any sense to me why the politicians thought that this would end the protests, but politicians are rarely the sharpest knives in the drawer. Anyway, people couldn't do only banking or purchases, and businesses in the region had to shut down. The internet shutdown was a disaster for Cameroon's economy, which lost around $3.1 million. In April, the government was forced to restore internet access. In February, Cameroon arrested three English-speaking protesters, Felix Agbor Balla, Fontem Aforteka'a Neba and Mancho Bibixy, and accused them of acts of terrorism, complicity in acts of terrorism, insurrection, propagation of false news, calling for civil war and calling for a return to the federal system, with the possibility of facing the death penalty.. However, they didn't have any actual evidence of those crimes, and so they were held in jail without trial. In an act of desperation, Cameroon's president Paul Biya announced yesterday (Wednesday) that all judicial proceedings against these and other activists would be ended, though it wasn't clear if or when they would be set free. This week, Biya has banned people from watching a popular cable television channel, SCBC, or the Southern Cameroons Broadcasting Corporation, claiming that it "terrorizes our people." The channel broadcasts programs about the history and culture of the Anglophone region, as well as interviews with exiled lawyers and documentaries about human rights abuses in Cameroon. Unfortunately for Biya, the station broadcasts from South Africa, so he has no way of shutting it down, and South African authorities have refused to shut it down for him. Cable operators in Cameroon are no long permitted to broadcast the channel, but people can still watch it over the internet (particularly now that internet access has been restored). The government has deployed an additional 400 police to the Anglophone regions, to join the 959 already deployed. The job will be to safeguard the start of the school term from the "persistent threat of activists." According to Ayuk Tabe, who is considered by some as the de facto president of the Anglophone regions, "I don't know any child in this world who'll go to school because he or she has been dragged by a policeman or army officer." If you get the feeling that Cameroon's government is run by idiots, I have the same feeling. Instead of sending in the army to force children to go to school, another alternative might be to hire English-speaking teachers to teach things like geography and math in English rather than French, and also to hire some English-speaking judges who could run some courts in English. Steps like that would likely help more than shutting down the internet. Biya's clownish actions have been extremely destructive to Cameroon and to its people and economy, but they seem to be typical of what we've come to expect of African leaders. Paul Biya came to power in 1982 and, as usual in African countries, Biya has turned into a dictator, using abusive measures against anyone who even criticizes him, anything to keep himself and his cronies in control.